I throughly enjoyed Master chef aired in Star plus.My fav contanstant were Zebi Zubair and Radhika.I thought these two ladies will be in the finals,but two didnt come to finals.Radhika just missed it and zebi got elimated before semi finals.I liked all the dishes cooked by Zebi Zubair.Few days back i tried her Zaika-e-basmati-khaas (actually it was a team effort). 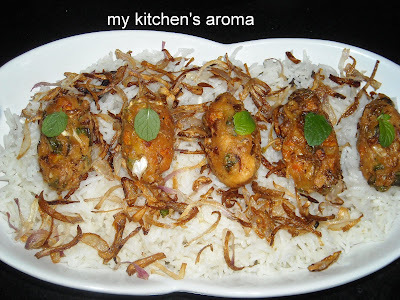 Mix together corn flour with cabbage,carrot,beans,cauliflower,ginger garlic paste,red chilly powder and salt.Mix throughly and shape into koftas.Heat oil and deep fry koftas.Take them on a tissue and keep aside. In the same oil fry onions and keep aside. In a deep pan, boil 1½ cups of water with green cardamom, black cardamom and peppercorns for 5-7 minutes. Add salt, boil for two more minutes and keep aside. In a bowl, whisk the curd with an equal amount of water. In a deep vessel, heat butter and add cumin seeds. When cumin crackles, add spice water and curd water and bring to a boil. Mix in rice and some more salt if required. Boil the rice on a high flame and when rice is just undercooked, reduce the flame, cover the vessel and cook till done. 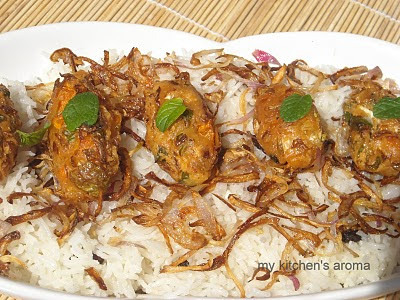 Serve the koftas on a bed of the prepared rice, sprinkled over with fried onions and mint leaves. I hve neve rhad this but it looks so so super yumm. Lovely presentation I think yours is better then Zebi..
Wow! That looks fantastic, tempts me to make it immediately. 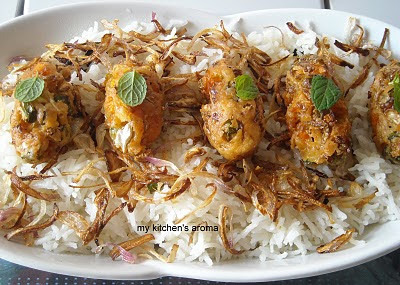 Basmati Khas looks yummy and fulfiling. Wow.. That's a very interesting Biryani. Looks delicious. Slurp,thats a delicious,marvellous and droolworthy rice..
even i thought one of them wl b masterchef.. den i thought jayanandan wl make it wen radika missed..
OMG ....really a delicious platter...wanna savour now..